Conover H, Ramachandran R, Beaumont B, Kulkarni A, McEniry M, Regner K, Graves S. Introducing Provenance Capture into a Legacy Data System. IEEE Transactions on Geoscience and Remote Sensing. 2013 ;51(11). Conover H, Ramachandran R, Regner K, McEniry M, Beaumont B, Graves S, Goodman M. Provenance as a Guide to Understanding Science Data. IEEE International Geoscience and Remote Sensing Symposium. 2013 . Murphy K, Teague M, Conover H, Regner K, Beaumont B, Masuoka E, Vollmer B, Theobald M, Durbin P, Michael K, et al. An Integrated Approach for Accessing Multiple Datasets through LANCE. 2011 Fall Meeting AGU. 2011 . Regner K, Conover H, Beaumont B, Teague M, Graves S, Hardin D. Processing Direct Broadcast Data to Reduce Latency of Aqua AMSR-E Products. In: AGU. AGU. San Francisco, CA; 2011. Regner K, Conover H, Beaumont B, Teague M, Graves S, Hardin D. Processing Direct Broadcast Data to Reduce Latency of Aqua AMSR-E Products. 2011 Fall Meeting AGU. 2011 . Conover H, Beaumont B, Kulkarni A, Ramachandran R, Regner K, Graves S, Conway D. Provenance Collection and Display Tools for the AMSR-E SIPS. In: NASA Earth Science Data Systems Working Groups (ESDSWG) Meeting. NASA Earth Science Data Systems Working Groups (ESDSWG) Meeting. Newport News, VA; 2011. 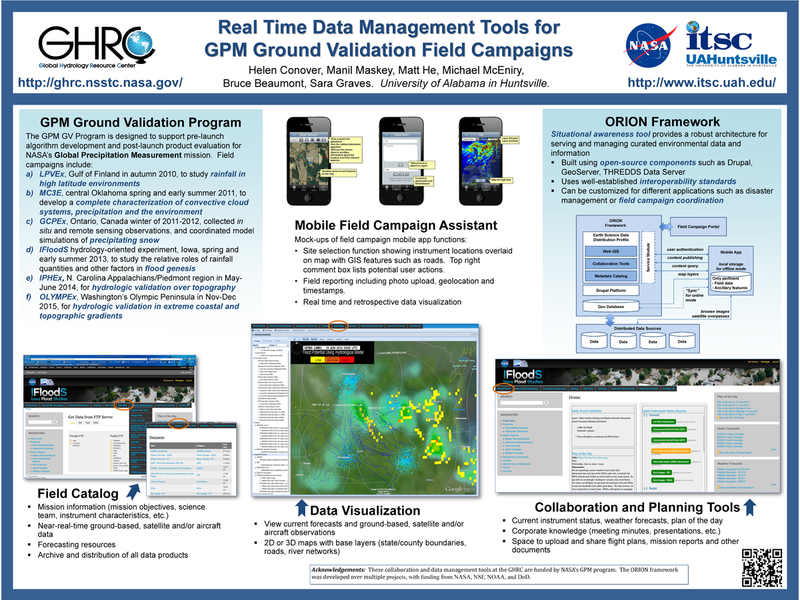 Regner K, Graves DS, Jones S, Harrison S, Beaumont B, Leon A, Conover H. Introducing LANCE, NASA’s Near-real-time Processing Capability for Aqua AMSR-E. In: American Geophysical Union. American Geophysical Union. San Francisco, CA; 2010. Conover H, Keiser K, Graves SJ, Beaumont B, Drewry M, Maskey M. Advanced Information Management Services in SCOOP, an IOOS Testbed. In: Joint Assembly of the American Geophysical Union. Joint Assembly of the American Geophysical Union. Baltimore, MD; 2006. Conover H, Beaumont B, Drewry M, Graves SJ, Keiser K, Maskey M, Smith M, Bogden P, Bintz J. SCOOP Data Management: A Standards-based Distributed System for Coastal Data and Modeling. IEEE International Geoscience & Remote Sensing Symposium (IGARSS '06). 2006 ;1:317-320. Regner K, Conover H, et al, Beaumont B, Graves SJ, Hawkins L, Parker P. Flexible Processing at the AMSR-E SIPS. In: IEEE International Geoscience and Remote Sensing Symposium (IGARSS '05). IEEE International Geoscience and Remote Sensing Symposium (IGARSS '05). Seoul, Korea; 2005. Goodman M, Regner K, Conover H, Ashcroft P, Wentz F, Conway D, Lobl E, Beaumont B, Hawkins L, Jones S. Atmospheric and Environmental Remote Sensing Data Processing and Utilization: an End-to-End System Perspective. International Society for Optical Science and Technology (SPIE) 49th Annual Meeting (Instruments, Methods, and Missions for Astrobiology VIII). 2004 . Graves SJ, Beaumont B, Smith M. ECS-HSA: the HEW Subsetting Appliance. In: HDF-EOS Workshop VII. HDF-EOS Workshop VII. Silver Spring, MD; 2003. Smith M, Beaumont B, Conover H, Goodman M, Graves SJ. Subsetting AMSR-E Data. In: AGU Annual Meeting. AGU Annual Meeting. San Francisco, CA; 2003. Ramachandran R, Alshayeb M, Beaumont B, Conover H, Graves S, Li X, Movva S, McDowell A, Smith M. Interchange Technology for Applications to facilitate generic access to heterogeneous data formats. IEEE International Geoscience and Remote Sensing Symposium (IGARSS '02) and the 24th Canadian Symposium on Remote Sensing. 2002 . Ramachandran R, Alshayeb M, Beaumont B, Conover H, Graves SJ, Hanish N, Li X, Movva S, McDowell A, Smith M. Earth Science Markup Language. 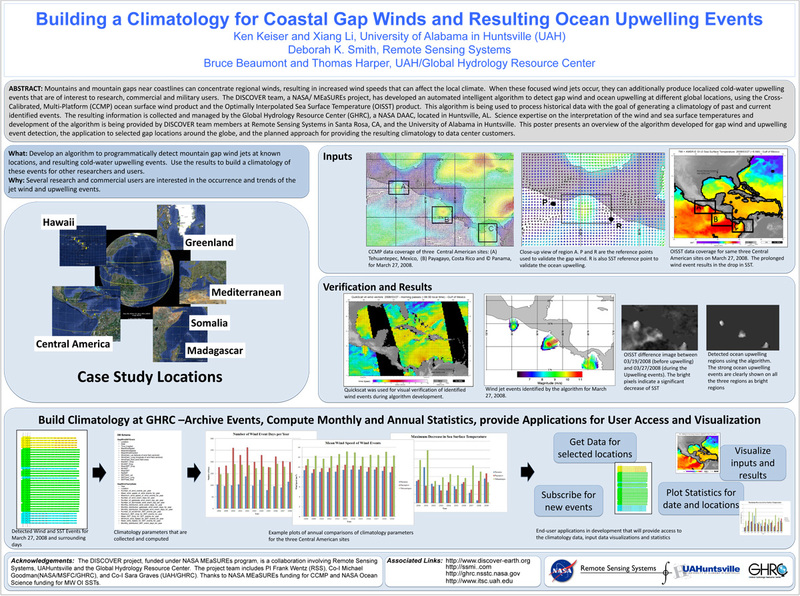 81st American Meteorological Society (AMS) Annual Meeting, 17th Conference on Interactive Information and Processing Systems for Meteorology, Oceanography, and Hydrology. 2001 . Ramachandran R, Alshayeb M, Beaumont B, Conover H, Graves SJ, Li X, Movva S, McDowell A, Smith M. Earth Science Markup Language: A Solution for Generic Access to Heterogeneous Data Sets. NASA Earth Science Technology Conference. 2001 . Smith M, Beaumont B, Graves SJ. A Dataset-Independent Subsetting Prototype. In: HDF-EOS Vendors Workshop. HDF-EOS Vendors Workshop. Goddard Space Flight Center; 1997. Smith M, Beaumont B, McCoy S, Graves SJ. Subsetting Data for EOSDIS. American Meteorological Society (AMS) 13th International Conference on Interactive Information and Processing Systems (IIPS) for Meteorology, Oceanography, and Hydrology. 1997 .